So if you follow me on Facebook, or you read between the lines of my post a few days ago about Tinkerbell's upcoming visit, you know that Reagan took a nasty spill on the driveway recently. Sidenote: no, Tinkerbell hasn't come yet. Madison has revealed that Tinkerbell will be leaving her a princess scooter, but she told her not to come yet. We'll see how long this goes. We had an initial moment of panic, because she broke her fall with her face. We were worried that she'd knocked out a tooth, because there was a pretty good amount of blood, and she was burying her face into me so we couldn't get a good look. When we finally got a look at her face, we were relieved to see that it was just some scrapes. Her mouth was fine, and everything was superficial, just bleeding more, probably because she was rubbing her face into me. Anyway, after the initial worry, it didn't look too bad by the time I got her calmed down. She wanted to go right back to running, but she was already up a little bit later than I wanted. I figured it was probably best to get her inside and in the bathtub. I gently washed her face and it looked like nothing more than a few scrapes. She went to bed perfectly happy. I was totally calm about it. She's a daredevil, and there will be moments where it catches up with her. No need to overreact. The next day it looked much, much worse. To the point where she looked like she'd been in a brawl. Her poor nose was raw, and I ended up slathering it in Triple Paste. Now, a few days later, it's still scraped, but much better. I think it'll heal up nicely. No lasting harm done. She doesn't stay still enough to get a good picture these days. Today she learned how to climb ladders. She was following Madison on the playscape, and just started up. Once she got up the first rung, she gave me a look as if to say "ohhhhh....that's all there is to it. Ok, go away, I've got this". Don't judge the outfit. She was sweating in the cute "capri" pants she was wearing, so I asked Madison to get her a pair of shorts. She chose this little skirt. Hey, it worked. And she did. All by herself, up to the top. She was so proud of herself. She did it over and over again. When she missed a step once, I was there to catch her, but she was fine. Just hung on with her little strong arms, while kicking her feet around to find the rung again, no panic or tears. She caught herself and held on. And then finished her climb. Of course, now she's 8 feet up in the air, and she still doesn't quite know how to sit down to slide down a slide. She just starts walking down until either an adult grabs her or - and this has only happened one terrifying time - she slips down into a sitting position herself. So my backyard time just got a lot more interesting. It is so hard to know how to balance her daring and impressive skills with my need to keep her safe. Everywhere we go, people freak out as she climbs onto tables, boxes, whatever, and we're so used to that we barely blink. We've got her furniture firmly secured to the wall and we don't police her around the house. She's downright terrifying at playgrounds. We get there and she and Madison immediately zip off in different directions, and she picks the most terrifying structure to scale - and does. And is THRILLED once she's up there. This seems to be her thing. She might not be chatty - yet - but man, she can climb. And run. And generally freak me out by her crazy skills. I hate to say it, but I can't wait to enroll her into gymnastics. Which is very scary to me itself. I might joke about being a "dance mom", but I really don't love the idea of pushing kids into activities this young. I have Madison dance because she really loves it. 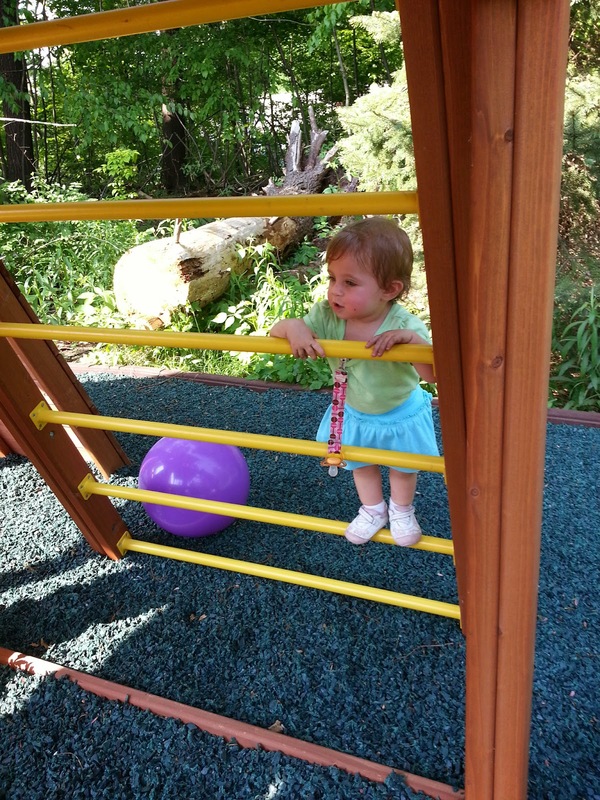 And I think I need to get Reagan into gymnastics ASAP, because since I don't think I can stop her climbing, and I'd like her to get a good outlet where she can climb and swing and dangle from bars with people trained to supervise that sort of thing. But for now, I'm toeing the fine line between hovering and, dare I say HELICOPTERING, around her, arms outstretched, ready for the inevitable fall so she doesn't scrape up her face again, and going free range, letting her explore and experiment, sometimes falling, but learning. I don't want to squash her, but I hated seeing her get hurt because she thought she was faster than she was and ended up with a scraped face. I think every parent has their own spot where they feel the most comfortable. I don't know that there's a "right" place to be (well, except for the extremes. Once something is taken too far...yikes). But where's the line for me? What side do I come down on? 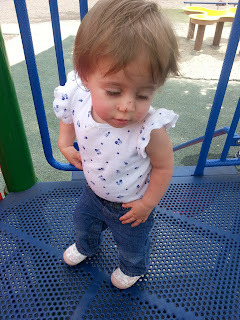 But with a summer of playgrounds, parks and pools ahead of us, I think I'll figure it out soon.